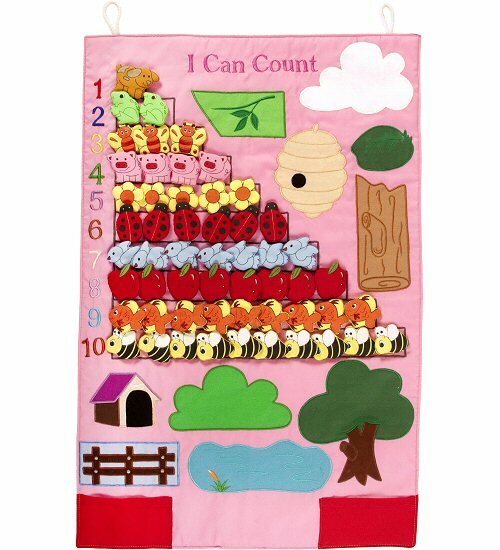 This fun and interactive I Can Count cloth wall hanging is pretty in pink and not only perfect for helping kids learn to count, but it also teaches kids about where things live as they place the Velcro-backed pieces in the settings where they belong. Kids will have fun counting and placing the puffy pieces either inside the stair-stepping blocks which correspond in size to the colorful, embroidered numbers on left or onto the pictures of where they would normally find each item. One puppy lives in the dog house. Two frogs hop on the lily pad. Three butterflies flit on the branch. Four pigs live in the pig sty. Five flowers grow on the bush. Six ladybugs crawl on the log. Seven blue birds fly in the clouds. Eight apples grow on the tree. Nine fish swim in the pond. Ten bees buzz the beehive. On a background of pink with white cords for hanging, this educational wall hanging has soft, puffy pieces, bright colors, and beautiful embroidery, along with two pockets at the bottom for storage. In addition, this I Can Count fabric teaching tool has space at the bottom for personalization (which can easily be done by your local embroidery shop) making learning to count a personalized and interactive delight.